economic future ahead – perhaps sometime in 2011. That’s the message some participants gave during the Dec. 17 annual meeting of the U.S.-Ukraine Business Council [USUBC] in Washington, D.C. One measure of success: Microsoft has recently joined the council, becoming the 100th member of the trade association. “Microsoft is very committed to the Ukrainian market and continues to expand its programs in Ukraine,” Dorothy Dwoskin, the senior director of global trade policy and strategy in Microsoft, said. 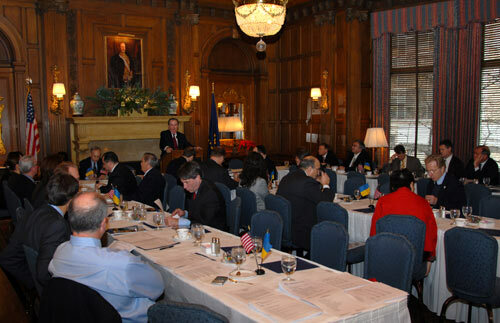 Morgan Williams, president of U.S.-Ukraine Business Council, said membership in the organization has gone from 22 members in 2007 to 100 members this year.” The group “added one new member per week in 2008,” Williams said. One key to the organization’s popularity is the “timely information [members receive] on the Ukrainian business climate and effective advocacy for reform and action,” as U.S. Ambassador William Taylor stated in a letter to the council. International Monetary Fund representatives attended to explain the $16.4 billion credit to Ukraine and to offer predictions about its economic future. Ceyla Pazarbasiouglu, the new IMF mission chief in Ukraine, said the nation’s growth rate may return to 5 to 6 percent by 2011, with lower inflation, assuming a global recovery in the second half of 2009.
nations’ importers are suffering from the global crisis. But familiar stories of corruption emerged. 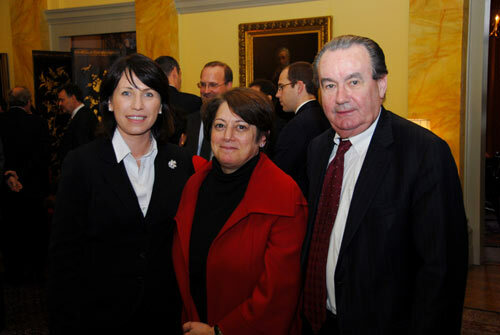 Jack Heller, attorney and partner Heller & Rosenblatt in Washington, D.C., reminded the audience that “the facts of expropriations of the U.S.
Ukrainian government officials of their obligations to improve the situation.